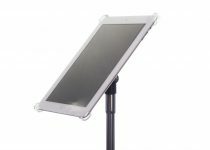 Features clear articulating arms for easy, hands-free viewing on the stage or for photography and presentations. AirTurn, a leading manufacturer of wireless controllers for iPads, Mac & PC computers, and Android tablets, announced its new PADLOK - iPad Mount for iPads 4/3/2. 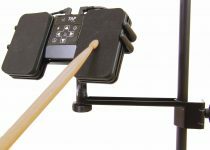 PADLOK attaches to a microphone stand converting the iPad into a functional music stand for performers, a presentation "podium" for speakers, or a photography aid with an unobstructed view of the iPad's rear camera. The PADLOK iPad Mount features four clear, articulating arms that attach to the iPad corners allowing for complete 360 degree rotation for portrait or landscape orientation. The PADLOK's self-locking hinge offers a fully adjustable tilt for ideal front-back viewing angle. PADLOK replaces the microphone clip on any standard microphone stand. It latches quickly and provides a smooth, precise rotation for musicians, speakers or photographers. "With the PADLOK iPad Mount, AirTurn now has a complete family of mounts for tablets and smartphones," said Hugh Sung, co-founder of AirTurn, Inc. "We give users the ability to get the most out of their iPad regardless of the application or work environment. Because the PADLOK allows the iPad freedom of movement from a portrait or landscape mode and tilts, the user is not restricted in his or her movements either. 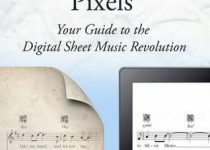 Additionally, the iPad on a mic stand doesn't separate the musician or presenter from their audience like a music stand or podium would." Pricing for the AirTurn PADLOK - iPad Mount is $29.00 and is available immediately at the AirTurn store. PADLOK is compatible with the 4th, 3rd, and 2nd generations of the iPad, but it is not compatible with iPad Air. Founded in 2008 in Boulder, CO, AirTurn, Inc. (http://airturn.com) develops cutting edge tools to enhance the wireless human interface with tablets and computers. 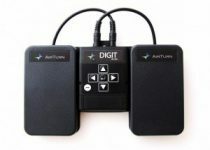 Musicians all over the world use AirTurn products to view and turn digital sheet music pages hands-free, and the company's growing community of over 150 partner developers is creating innovative applications for AirTurn's wireless controllers like the BT-105 foot pedal and the Digit page turners. AirTurn has also developed a family of mounts for mobile devices so they may be used in a hands-free mode for multiple applications. AirTurn, Inc. is the owner of the following trademarks and/or service marks: AirTurn, PADLOK iPad Mount, BT-105, DIGIT. All other trademarks are property of their respective owners.